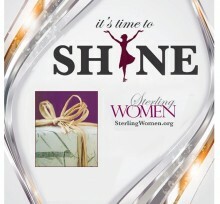 Join Sterling Women in their efforts to raise money for 12 non-profits. This 2015 calendar features “Sterling” Women Who Shine. Each page features a portrait, their passion and details about the non-profit they are supporting. It is easy to make a donation, receive your calendar and lend a helping hand. Cindy is supporting The Cherry Blossom Breast Cancer Foundation. At $10 each, these make the perfect corporate or personal gift.